Civilizations across the globe have tested engineering and strength while erecting large stone monuments. Hundreds of Boulders have been found propped up and positioned on ley lines across North America. Most often these Propped Boulders correlate to an equinox , solstice or Metonic Lunar cycle much like Stonehenge and other examples of ancient stonework. Modern day scholars have classified much of what is discussed here as enigmatic stonework. Many have pinned it to a time of Druid explorers or Vikings while others give credit to mother nature and coincidence. It is my belief that these stones were created by the natives that walked this land tens of thousands of years ago. Boulders often take the shape of an animal and their surfaces can be noticeably different than their surrounding counterparts. Fully Propped boulders can include multiple stones for the base while partially propped boulders utilize an outcropping of ledge and one or more smaller stones for balance. There are many unique attributes to each example. Think of these boulders as sculptures. Orange, Pink, Red and White veins of color run through large granite boulders. Quartz striations in various colors are symbolic to the purpose of each stone. The boulders surfaces appear to have been worn down or tooled to a much smoother texture. Visual evidence of sot at the base of many stones leads me to believe that fire was used in shaping and sculpting. Heating up the stone in the winter would allow the water to expand popping off layers of granite. The end result is a “thermaled” surface, something quite common in today’s stone industry. Hand tools must have also been used as details of many stones are to precise to use the thermaling process. This partially propped boulder is located at 1100 feet in elevation. Roughly 400 feet from the lower forest floor in which it can be seen from nearly a quarter mile away. It’s shaped like a perched Frog. Snow helps to distinguish the eyes on top , the rear to the left and the belly sloping up to the mouth (right side). This stone is in alignment with other megalithic stones on the site and I believe it is tied into the Metonic Cycle, the Major and Minor Lunar Standstills. 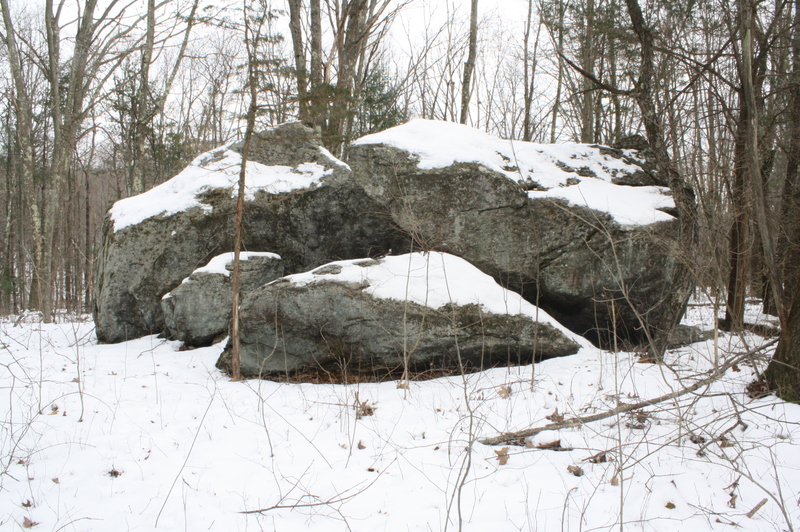 This large boulder sits atop the highest point of the site. It is positioned to the eastern and western cardinal directions. Like the previous boulder it shows the characteristics of a frog with a stance looking ready to jump. The belly of this Frog actually provides shelter and evidence of smoke is clear. I imagine this stone would have served the purpose of signal rock as it has three hundred and sixty degrees of viewing at 1100′ in elevation. This large boulder is positioned on it’s side and clearly resembles the shell and head or a Turtle. I suspect this stone is used in alignment with others marking the Metonic Cycle. This 18.6 year Lunar cycle could be observed from this location. 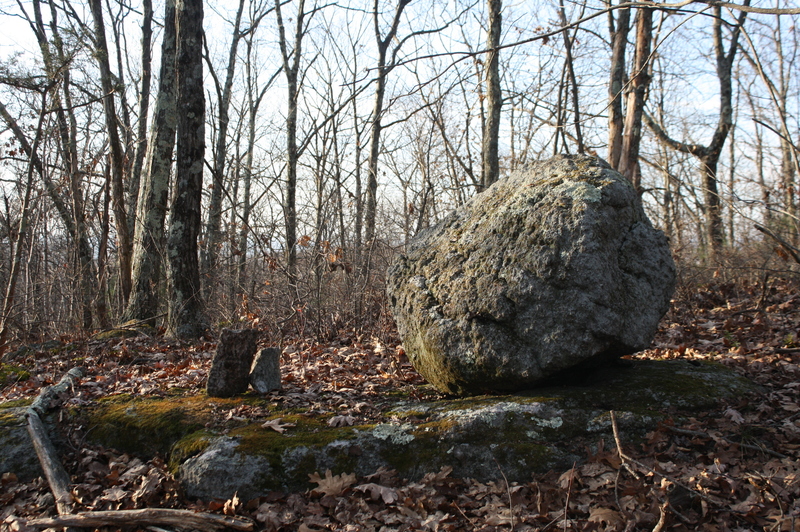 Large propped boulder, much like the sites of a gun, sit 100 feet beyond this stone. The large boulder or “Turtle Rock” splits the two stones down the middle. It is my determination that the major and minor lunar standstills occur between these two stones and while laying below the head of the this large stone one could bear witness to the event. This stone is close to the Summit Stone and the top of the hill. The three legged base is still in place and the boulder has fallen on its side over time. It must have broke upon hitting the ground. This is similar to other stones on the site that were once standing and have since fallen. I suspect an earthquake at one time could have tipped over the majority of these stones along with erosion and tree growth. This slope side stone is one of the largest on site. It closely resembles a Sleepy Turtle or a Whale. The surface of this stone is similar to other assumed worked stones. A smooth granular surface with occasional quartz striations are typical. There appears to be some type of rough tooling marks as well. This boulder is a functional stone and serves as a viewing bench. Views to the west provide an ideal location for the setting sun. This stone looks like the model of a large molar, although I’m sure it’s not, and is one of the most interest stones in terms of workmanship. This propped boulder sits on top an exposed ledge and is balancing with a remarkable overhang. There are no smaller stones to support this. It sits alone. The impression I am left with is one of a large Bear head. To the far right, the snout , rolling up over the top to the crest of the head and down the back. This stone is located roughly one half mile from the base on the mountain. It is in a large flat clearing of land laying on its side in six pieces. The base of the stone (right side) is flat and would have rested on two stones propping it up. (add link) This stone would stand thirty feet tall. Other stones of the same size have been documented. (see Turner Falls, OK) One of the base stones is shaped like an Eagle head. With no trees this stone could be seen at the top of the mountain three quarters of a mile away and also down at the river almost two miles away. It welcomed anyone who had made the journey to this very sacred site.